A wide variety of events are a part of the life of our Church, some are fund raising, others are social events and many qualify in both categories. Some of the events planned for the near future are listed here together with reports on the events that have happened in the recent past. 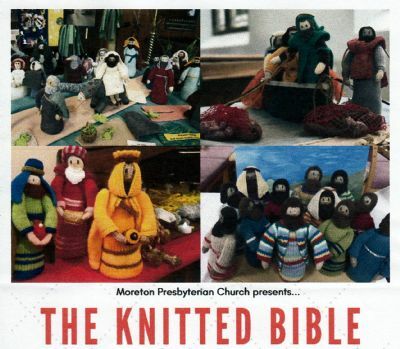 We extend a warm invitation to you and your friends and family to come along and see ‘The Knitted Bible’, which will be on display in our church the week 2nd - 9th March 2019. This display is on loan from Hartlepool United Reform Church and depicts 33 scenes from the bible with knitted figures and animals from both old and new testament. Saturday 2nd 10.00 am - 4.00 pm. Monday 4th 10.00 am - 4.00 pm. Tuesday 5th 10.00 am - 4.00 pm. & 6.00 pm - 8.00 pm. Wednesday 6th 10.00 am - 4.00 pm. Thursday 7th 10.00 am - 4.00 pm. Friday 8th 10.00 am - 4.00 pm. & 6.00 pm - 8.00 pm. Saturday 9th 10.00 am - 12.00 pm. If you would like to know more about the display please will you click here to contact me by e-mail. Refreshments will be available, and we look forward to seeing you. attended and who helped make this event a success. On the 10th April, our church secretary Ruth Wynn was inducted as Moderator of the Association in the East. The one year tenure of this position began with a service in Aberystwyth. Ruth will lead the Association, one of three Associations which comprise the day-to-day management of the Presbyterian Church of Wales. This is an honour for both Ruth and our church in Moreton. A Service was held at 7.00 pm on Thursday 19th April in our church in Moreton to ordain 3 new Elders for our church in Moreton and one for the church at Northop Hall in North Wales.